PHO 236 joined our Mission to help provide access to “Clean Water for All by 2030”. This Mission was initiated by the United Nations. A big thank you to PHO 236’s team and customers for joining this extremely important mission on 28 December 2017. "Look in through the window and you'll see exactly what the deal is; cheap but delicious. Always busy, and turnover is pretty quick. I even ventured away from the pho a few times, Mongolian beef is good. 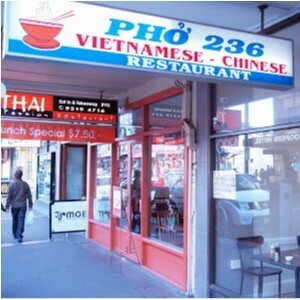 But what separates Pho 236 is that the tofu in all their dishes is always so perfectly done."